The Me Too Act, named after the social media campaign that flooded Twitter and Facebook feeds in recent weeks and brought to light the frequency with which women from all walks of life cope with sexual harassment and assault, demands an overhaul of the complaint process women in Congress must navigate in order to report sexual misconduct. “The system to address this problem is virtually unknown to most staffers, very confusing to navigate, and tilted against victims,” said Sen. Kirsten Gillibrand (D-N.Y.) who joined with Rep. Jackie Speier (D-Calif.) to introduce the legislation. Currently, Congress appears to do everything in its power to discourage victims from filing complaints. Anyone who wishes to file a harassment complaint against a member of Congress or staffer must spend up to 30 days in counseling, followed by mediation with the person they are accusing. In mediation, Congress provides the accused person with an attorney while the accuser must provide his or her own legal counsel. The accuser is also required to sign a non-disclosure agreement, and after mediation a 30-90 day “cooling-off period” is imposed before he or she can make a formal complaint. The Me Too Act would do away with the waiting period imposed on victims and end forced mediation. Speier was one of several women in Congress who spoke publicly about the prevalence of sexual harassment in the nation’s lawmaking body, saying Tuesday that she knew of two sitting members of Congress, one Democrat and one Republican, who had harassed staff members. “The culture in this country has been awakened to the fact that we have a serious epidemic in the workplace in all professions, in all walks of life, and it’s incumbent upon those who are in authority to address it and address it swiftly,” said Speier. Also on Tuesday, House Speaker Paul Ryan (R-Wis.) announced that the House would begin requiring sexual harassment awareness training for all members and staff members, and the Senate passed a measure last week mandating a similar program—but on Wednesday Gillibrand indicated to reporters on Capitol Hill that the entire system through which Congress handles sexual misconduct in its ranks is in need of revamping. 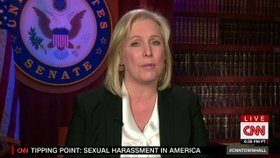 “There is a serious sexual harassment problem in Congress, and too many congressional offices are not taking this problem seriously at all,” said the senator.